Sitting opposite Sony\'s PS3 theater in the corner of this year\'s Asia Game Show & DEE Asia in Hong Kong is a controller that will change the game industry. The design project\'s creator, a recent graduate of the School of Creative Media in Hong Kong named Addi Lam, calls it a senior design project. But Nintendo calls it a revolution. About the time Nintendo was showing off the Revolution\'s pretty packaging and dropping hints about the future of game controllers at E3 2005, Addi was showing his teachers a video game he\'d designed with a controller you tilted and turned to control. He called it Pebble. While Nintendo was titillating the gaming community about old technology used in new ways, Addi Lam was beating them to it. If his student presentation had been set up across the street from the L.A. press conference in mid-May, the gaming media would have made him instantly famous. They would have picked up his gaming controller and been able to say, \"So this is Nintendo\'s revolution. This is what they see as the future of video games. And a creative media student in Hong Kong saw it first.\"
Addi\'s Pebble is built more as a proof of design than a game unto itself, though it works as both. The two player game allows users to race marbles around a track, tilting their controller to gain speed and keep from falling off as they corner. The two player battle modes allow competitors to push bombs into each other in an attempt to throw the other off the platform. It feels almost instantly natural, which bodes well for Nintendo\'s next generation game system. Its design looks very much like Marble Madness, or Mercury on Sony\'s PSP, games that Addi had never played by the time he started work on the project in 2004. The controller itself looks nothing like the Revolution\'s sleek white design, of course, but like a box-car toy that\'s been assembled in a garage. It has a button for boosting speed and a button for jumping, and the rest is in the movements. But underneath the exterior is one of the key elements that\'s going to make the Revolution sell like hotcakes when it reaches the market. What\'s amazing is how well Addi - fairly isolated from the mainstream game industries of the U.S., Europe, and Japan - seems to be on the same wavelength with one of the most free-thinking and beloved companies in the market today: Nintendo. \"When I started,\" Addi says, wearing a gray shirt, sports jacket, and blue jeans, \"I laid in my bed and tried to think, \'What is a game that has never been done before?\' I was looking for the childlike experience. I wanted it to be simple.\"
What he came up with was the same answer that Nintendo came up with when their designers laid in bed asking the very same question. Change the controller. \"I wanted to make it organic,\" Addi adds, trying to explain why he built the system the way he did. \"I wanted to connect hand movements to what happens on the screen.\" He pauses, and tries to think of the right words. \"I wanted to connect to the subconscious imagination.\"
In an industry defined by creative game talents like Will Wright and Shigeru Miyamoto, Addi Lam sounds very much like someone the game industry should be interested in listening to. Addi Lam\'s creation, which started to take shape long before the industry knew what the Revolution would look like, is proof of more than just creative talent. It\'s proof of the value of game education like the university programs being pushed in North America by companies like Electronic Arts and Ubisoft. In fact, it was an intense two week summer program at the City University of Hong Kong that put Lam on the design track. Christopher Swain and Tracy Fullerton of the EA Game Innovation Lab came to the school to teach game design to a class of about 20 people. Addi Lam was one of them. \"They had us analyze games, breaking them down into categories,\" Addi says. \"Then they had us start by designing board games. It was the starting point. I learned from them how to design a game.\"
Shortly after, he began work on Pebble, coming up with the controller design and then building a game to go with it. \"At the time, I didn\'t know what would make a good game,\" Addi explains, describing how he began the design process. \"Later on, I knew that a good game had certain elements. I made it until it was fun.\"
Lam\'s hunt for the childlike experience in his design philosophy matches well with comments made by Nintendo that they wish to reconnect with the casual gamer through the Revolution. \"For me the most amazing gameplay experience was when you had the gun,\" Addi says, referring to the light zapper on the NES that he had when he was 11 years old. \"When you fired, something happened. Then, I couldn\'t figure out how it was done.\"
\"I still don\'t know. But it was the reward. When you play a game you have to reward the player.\"
Addi is quick to point out that others have used the same approach to controls, but not in a way that felt natural, comments that echo Nintendo\'s ideas on the design. Again, the similarities between Addi Lam\'s approach to game design and Nintendo\'s concept of the future are remarkably close, though Addi seems relatively unfamiliar with Nintendo\'s work since the Famicom when he was a kid. \"I got a (Sidewinder for the PC) as a gift when I applied for a credit card,\" Addi says, explaining how he wanted to make something that was not just new, but also fun. \"I could choose between the Sidewinder and another electronics gift. I was very excited. But I stopped using it after two or three tries and was very disappointed. I thought I should have picked the other (gift).\"
The Sidewinder was a Microsoft released joystick that used gyroscopes for controlling games. Because of the lack of titles designed to take advantage of the controller, it often felt unnatural to the player. There\'s a sense of irony to this story that Addi obviously finds amusing. Still, the concept apparently stuck with him. Years later, it was the Sidewinder he turned to when he began designing Pebble. The result was a game that could be played long before Nintendo unveiled their Revolution at the Tokyo Game Show, and is surprisingly addictive, even in the most basic of forms. The gameplay has been fine-tuned to offer more than just a new way to interact with the software, but the beginnings of what could easily make a game title you\'d want to own. 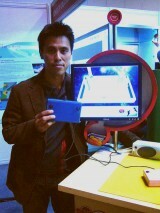 Perhaps Nintendo should have hired Addi Lam when putting together their technology demonstrations on the Revolution. It might have been worth both their while. Until Nintendo releases the Revolution, there\'s a lot of speculation about how well their control approach will work. Will it feel natural? Will it make games better, or worse? So far, only limited numbers of media have been allowed to touch the new controller, and no actual game demonstrations have been made available. Until E3, it\'s very likely that Pebble is as close as most people will come to touching, seeing, and understanding Nintendo\'s vision. It\'s ironic, therefore, that the best source for seeing Nintendo\'s vision is someone that\'s not related to Nintendo at all. Addi Lam went to work in Hong Kong making television commercials after graduation, work that he enjoys, but isn\'t his passion. \"I would like to work in video games,\" he says. \"But, I believe I am lacking skills in programing. I can\'t just tell people that I am a good designer. You can\'t just be a game designer.\"
I couldn\'t help but point out that in an industry where success is often defined by the merits of a game\'s design, game designers like Will Wright and Michel Ancel are the closest things we have to rock stars. It was a misconception I was happy to correct.